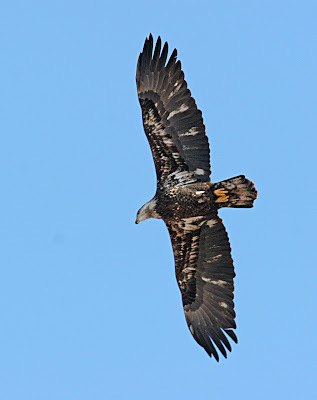 Ordean eagles which nest on the Minnesota shore opposite Wisconsin. Although the Bald Eagle is no longer on the endangered species list, this does not mean they are no longer legally protected. In fact, because of the Bald and Golden Eagle Protection Act which was enacted in 1940, Bald Eagles are even more protected, and on a national level. Encourage additional nonbinding land management practices that benefit bald eagles (see Additional Recommendations section). Although the Duluth School District has told the public that the eagles’ nest would not be disturbed, what they haven’t mentioned is that they do not have a permit from the U.S. Fish and Wildlife Division of Migratory Birds Permitting Office. The Duluth School District was told in early December 2008 that NO permits were available, and that NO new permits were being issued at this time. The U.S. Fish and Wildlife Service Permitting Dept. does not know when any permits will become available. 1) The Duluth School District is required to follow the National Bald Eagle Management Guideline s as developed by the U.S. Fish and Wildlife Service. 2) The definition of “disturb” – as stated in these guidelines – is very specific. It cannot be redefined by the District, or their representatives. 3) An eagles’ nest is considered to be “active” for 5 years – even if there are no eagles present. In addition, because the Ordean eagles’ nest is near water it is also considered a roosting and foraging area. This is another “plus”. Note: “Migrating and wintering bald eagles often congregate at specific sites for purposes of feeding and sheltering. Bald eagles rely on established roost sites because of their proximity to sufficient food sources. Roost sites are usually mature trees where the eagles are somewhat sheltered from the wind and weather.” The Boyd’s property is a significant part of the eagles’ habitat. 4) If the Duluth School District chooses to proceed with their plans at the Ordean site, without a permit, they are doing so at their own risk. 5) A violation of the Bald and Golden Eagle Protection Act can result in a criminal fine of $100,000 ($200,000 for organizations), imprisonment for one year, or both, for a first offense. Penalties increase substantially for additional offenses, and a second violation of this Act is a felony. Note: Who will pay this penalty? Superintendent Dixon? 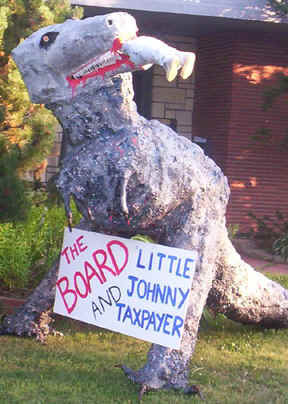 The school board members? JCI? The taxpayers? 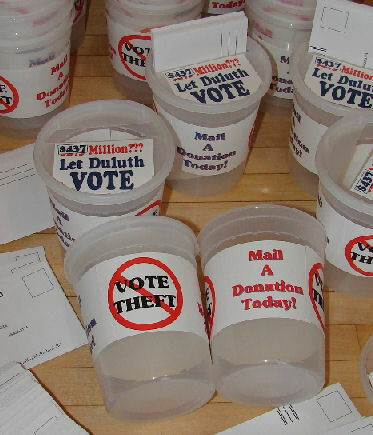 Note: I have since found out that the Duluth School District would pay all fines and litigation costs – which means that we, the taxpayers, would end up paying the fines. Note: Construction occurring during the nesting/hatching/rearing/fledging season – January to July/August – carries with it the great potential of disturbing the eagles. That pretty much leaves late summer, fall, and part of winter as the construction months that would be deemed “safe”. Why is the DSD willing to take this risk when Central H.S. would make an excellent second high school site? 7) Another eagles’ nest, in another location, is NOT the standard. We are talking about this eagles’ nest, and this pair of eagles, at this particular location. 8) It is highly advisable that the Duluth School District restrict construction activities as recommended in the National Bald Eagle Management Guidelines and maintain at least a 660 ft. buffer around the nest. Note: There is some wiggle room here because of the already existing fields/structures. The eagles and the nest are protected on a national level by the Bald and Golden Eagle Protection Act. If the construction causes the eagles to abandon the nest and there are eggs or nestlings present, the school district could be held liable by the U.S. Fish and Wildlife Service if it does not have a permit. 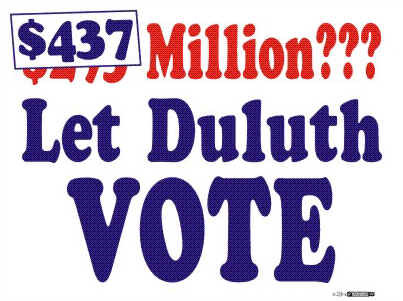 3) How will the formal notification to the Duluth School District from your department help our situation? I am advising the Duluth School District of the need to comply with the National Bald Eagle Management Guidelines in the absence of a permitting system. Note: A formal notification was sent to Superintendent Dixon on 1/13/09 from Andrea Kirk of the U.S. Fish and Wildlife Service. 4) What if the Duluth School District “assures” you that they will comply with the National Bald Eagle Management Guidelines, but they begin construction during a critical time? What should the citizens do? What can the U.S. Fish and Wildlife Service do? If the district begins construction during the breeding and nesting season, citizens should monitor the behavior of the eagles. If the eagles abandon the nest and leave their young, the US. Fish and Wildlife Service Law20Enforcement Division should be contacted immediately at: 651-778-8360. Note: There is nothing that the U.S. Fish and Wildlife Service can do until the eagles are disturbed. This is very unfortunate as by that time, it could be too late. I contacted him the week of Thanksgiving. He said the only contact he had had re the eagles’ nest was back in April 2008 when a landscape architect firm contacted him (he didn’t recall who it was). They were looking for more info as they were considering putting in a bid on the Ordean site. Phil came to Duluth, and he looked and drove around the site. He did not contact the Boyd’s nor did he go on their property. He never spoke directly to a District representative, nor was he aware of any District representative contacting their office. Note: I have been informed by Kerry Leider, Property and Risk Manager for the DSD, that the architect firm was LHB. Phil Delphey was not aware that they were representing the District. This was a general site visit. Phil does not recall seeing any design plans at that time, although he may have –> Important: See 2/9/09 e-mail below. Phil has not seen any design plans since his visit to Duluth in April 2008. “Also, I would describe their communications with me as sporadic and indirect - it's hard and maybe not worth much to parse their words ("all along") too carefully, but I think that Katie is the first person that has contacted me who actually works for the school district. This is the official who I have been in contact with since 12/12/08. She has been extremely helpful. “Disturbance is measured after the fact. In other words, if the eagles abandon the nest AND the nest has young or eggs in it, disturbance occurs. Disturbance is prefaced upon nest abandonment. Very helpful and knowledgeable individual however, he said that we need our help to come from the local level (Bloomington, MN office of U.S. Fish and Wildlife Service).